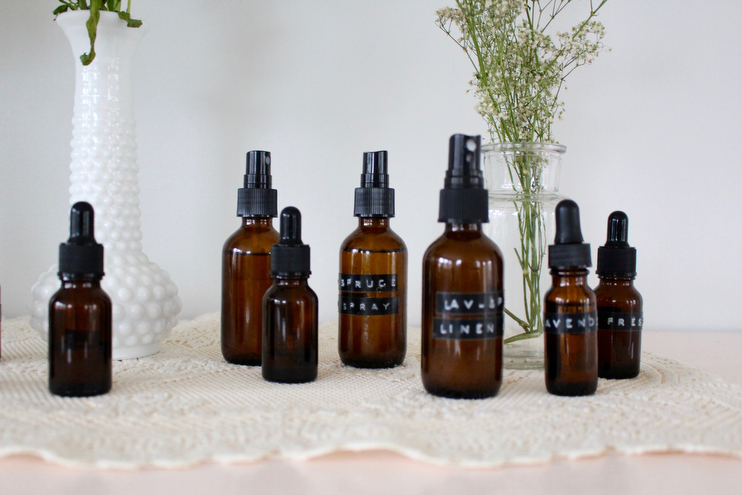 One our family’s favorite ways to use essential oils is in homemade spray remedies and tonics. We use them as a part of our morning routines when getting ready, in the kitchen after bringing home fresh produce from the market, before bedtime to calm and relax, and in a handful of other practical everyday situations that call for a balance or boost. Making sprays is not only a very cost effective way to help stretch the life of your essential oils, but also gives you a tool for simple application. When on their own in tiny amber bottles, oils can be somewhat intimidating. I get this. But sprays help take the grunt work out of this wellness process and give you a remedy that you can pop in your purse or store on your nightstand. With this in mind, know that you too can create personal blends with your oils that best suit your wellness and home needs. These are our favorite recipes and I am happy to share them with you! 2 oz. Glass Amber Bottles – I purchase mine in bulk here. Witch Hazel – This ingredient acts as an emulsifier so the oil evenly distributes throughout the blend. You could substitute a pinch of salt or even replace witch hazel for vodka in these recipes if you’d like. 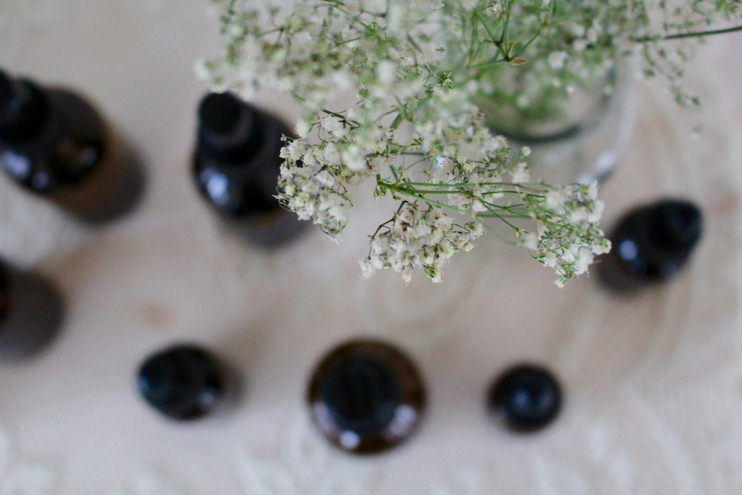 Essential Oils – I buy all of our essential oils from Young Living. You can read more about that here and here. Distilled Water – Purified water spoils less quickly so I use it in all of my homemade remedies. You need to be careful when making water-based solutions because anything with water in it can spoil believe it or not! This is why I like making very small batches in 2 oz. bottles and storing the sprays we do not use as often in the fridge. Small funnel – Optional, but it helps. You can prepare all of these sprays the same, simple way. Start with your 2 oz. glass amber bottle and fill it up 1/3 of the way with witch hazel or vodka (or a small pinch of salt) it’s your preference. Some like to use distilled vodka in place of witch hazel because it does not have a scent. I think all three methods are wonderful. After adding your emulsifier, add your drops of essential oils. Swirl the bottle around combing the oils before filling the rest of your amber spray bottle up with distilled water. Shake before spraying and store in a cool, dark place. Gentle Baby Spray: I used this spray while pregnant with Alfie and wore it as my all natural perfume, spritzing it when needed. We still use it on seven month old Alfie after bath and diaper changes because it’s so soothing and gentle enough for tiny ones, making his skin so soft and yummy. This was also the blend we diffused in the delivery room so it’s a special one for me. Note: Diffusing ratios are different than spray ratios. When I diffuse I like to add 5 drops or so to our home diffuser. Owie Spray: This spray is in our holistic medicine cabinet and one we pull out when the kids get scrapes or cuts. I will spray it on their owie a few times throughout the day and it helps significantly. Sleepy Spray: This is our favorite sleep spray blend that I mist their blankies and pillows with before bed and nap time. It has become a special part of our bedtime routine and a spray that I take with us when we travel. Andrew and I also use it on our own pillows before bed as well. Sometimes I’ll find Andrew spraying it all over his pajamas before hopping into bed. Super cute. Wake Up Spray: This spray is such an uplifting one to have on hand. I like using this as a morning mist that helps me wake up if I have not gotten the best night’s sleep. The combination of citrus and peppermint is very awakening and a good way to jumpstart your day. And Bergamot…it’s the best. Under Arm Spray: If you are wanting to steer away from using deodorant with chemicals and other less than pleaseant ingredients this is a nice spray to have in your beauty cabinet. The blend Purification contains: Citronella, Lavandin, Lemongrass, Rosemary, Myrtle, and Tea Tree. I like using this spray after yoga or a walk with the kids and I am in need of a little help, if you know what I mean. Floral Date Night Spray: This spray is a lovely perfume to wear on nights out with your honey as many of these oils act as natural aphrodisiacs. Just sayin’. Tick Spray: I hate that I have to include this BUT Stella’s preschool had a case of head lice so I’ve been spraying her hair with this before and after school each day. Keep those nasty little bugs away! Mosquito Repellant: As soon as warmer weather approaches we do not go anywhere without this natural chemical free bug spray. It’s safe enough to put on little ones and it actually works. Praise! We get bad mosquitos here in the Midwest and this is a staple for our family. Calming Spray for the Kids: This is Stella and Theodore’s calming spray blend. If they are really hyper and acting out I’ll grab this and spray them down. It may sound a little strange but they are used to it and sometimes will even go grab it and spray it on themselves when in need of a cool down. Stella calls it her perfume and Theo just loves his oils. Teaching my babies to own their wellness and become a part of that process is such an important part of our essential oil journey. Calming Spray for Mama: This is my own stress away blend. YL makes a beautiful blend called “Stress Away” but after experimenting and trying this and that, I have found this blend to be the best for my anxiety. This is my go to perfume and something I wear daily. It’s a simple blend that combines elements of the earth with both floral and citrus notes that are very uplifting, with the grounding element of frankincense. Hair Growth Support Spray: I am using this on my scalp for hair growth right now. I always end up loosing a lot of hair in my fourth trimester and this tonic has helped my hair remain thicker and healthier for the most part. I use it after washing and before blow drying, spraying it on my scalp where the hair loss is more prevalent. After Sun Spray: This spray is a lovely one to have in the fridge in the heat of summer. If you are prone to sunburns getting this out and spraying it on your skin immediacy cools it down and starts the healing process. If you aren’t someone who burns, this is still a nice spray to use after workouts or if needing a cold pick me up in the middle of the day. Yoga Mat Spray: I like this spray for two reasons. For one, it helps clean my mat before use because tea tree is magical, and secondly, the two blends in this spray are very grounding and meditative…a scent inviting you into a calmer place before you practice. Changing Table Spray: If you have little ones in diapers, or kids in general, this is such a good spray to have on your changing table or in your diaper bag for those gross restaurant changing stations. These three essential oils combined or on their own are very good at getting rid of germs. Farmer’s Market Spray: Once produce stands start to open and farmer’s markets become a part of your weekend plans, this spray is helpful to have in the kitchen. I rinse our fresh produce with water and spray it with this before eating. Clean Linen Spray: This linen spray is so lovely. I like spraying our clean clothes with it, Andrew’s suits, and just spritzing it here and there in various draws now and again to give our clothes a refreshing smell. This one is also great for freshening up furniture and bed linens, too. Bathroom Air Freshener: This one is pretty self explanatory…put a bottle on the back of the toilet or somewhere in the bathroom and enjoy not smelling certain scents. You’re most welcome. Have you used essential oils in this way before? What are some of your favorite combinations and blends? Happy spray making y’all! *Quote source information found here. Hello! This is such a wonderful site! I’ve been toying with the idea of oils for some time but the thing that I can’t seem to grasp is the safety for babies and children. Do you have a good source to explore which are ok and which aren’t? Dear Eda, that’s exactly how I came to my essential oil love. 😉 Thanks for the book recommendation! I will have to order that one, too. I hope you like Eliane Zimmermanns book. If I would have known that you already have Ingeborg Stadelmanns one, I would have said, that might be enough. But it’s never bad to have lots of resources, right? 😉 Have fun with your oils! And your baby of course. :-* And I too read Hebammensprechstunde! Amanda, your blog is gorgeous! I adore everything about it! I’m a new mother and your inspiration is so uplifting. My husband and I actually live in Kansas City, too. Overland Park specifically. 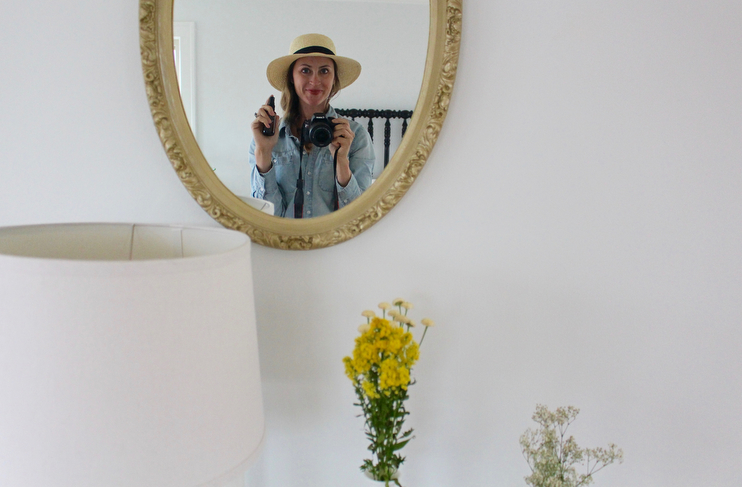 I’ve only just discovered your blog after being a long time insta follower – way back when you just had dear little Theo! I’ve just recently started using EO’s and I’m super excited to try some of these great sprays. Thank you for sharing. I was wondering if you noticed a difference using salt, witch hazel or vodka as an emulsifier? Is the storage life different or would all three work well? Thanks a lot for your answer. Hi Amanda. Thank you SOOOOOO much for this article. I am creating some of these mixtures for my kids, and was wondering if I spray it directly on them or in front of them and let them walk into it. I wasnt quite sure and didnt want to do anything before checking in with you.